If you’re not familiar with the ketogenic diet you aren’t hanging out in gyms or health circles. The ketogenic diet has become trendy of late, but the origins have been around for a while. Dating back to the 1920’s as a treatment for epilepsy. The keto diet works by promoting the metabolic formation of ketone bodies in the blood system by causing the body to burn fat instead of carbohydrates as a principal energy source. The most important thing for reaching ketosis is to avoid eating too many carbs. That’s the basic rule of the diet. Although it varies by person, “Too many carbs” means keeping your carb intake under 50 grams per day of net carbs, ideally below 20 grams. The fewer carbs, the more effective the diet is. It’s because of this low carb rule that makes a typical bloody mary pretty much out of the picture for those on a ketogenic diet. Tomato juice typically has a ton of carbs and most bloody mary mixes fall into high carbohydrate camp too. Example: Popular mix Zing Zang’s is going to put you at around 10-12 net carbs per serving. One drink and you’re already over half your daily intake. We think you can do better on taste and lower on carbs. Even if you’re on a low carb diet, you can still have a bloody mary. Here’s How. 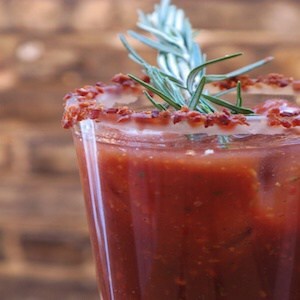 It’s about using a keto friendly bloody mary mix, like Stu’s. Stu’s Bloody Mary Concentrate fits into a keto or a low carb diet. It’s only 5-10 calories per serving and 0 carbs, you won’t be sacrificing your keto diet to enjoy a bloody mary. Because Stu’s is a concentrate mix with no tomato juice, it is perfect for a low carb diet. Stu’s allows you to add more of the mix and less of the higher carbohydrate-rich juice, but without sacrificing flavor. Stu’s is also Gluten Free and made with all natural ingredients. No MSG. No nasty preservatives. So you are still maintaining real and pure ingredients. Typically we use 2oz of Stu’s with 6oz of Tomato juice in a traditional bloody mary. But to keep this version low carb we are going lower on the tomato juice and higher on the Stu’s Bloody Mary Concentrate. Take 3 strips of bacon and crush it in a food processor or by hand into tiny bits. Wet a highball glass rim with a few drops of water and roll bacon bits on rim. Add your choice of vodka. Note: We prefer an organic tomato juice, but even Cambell’s only has 6g net carbs for a 5.5oz can. Enjoy! 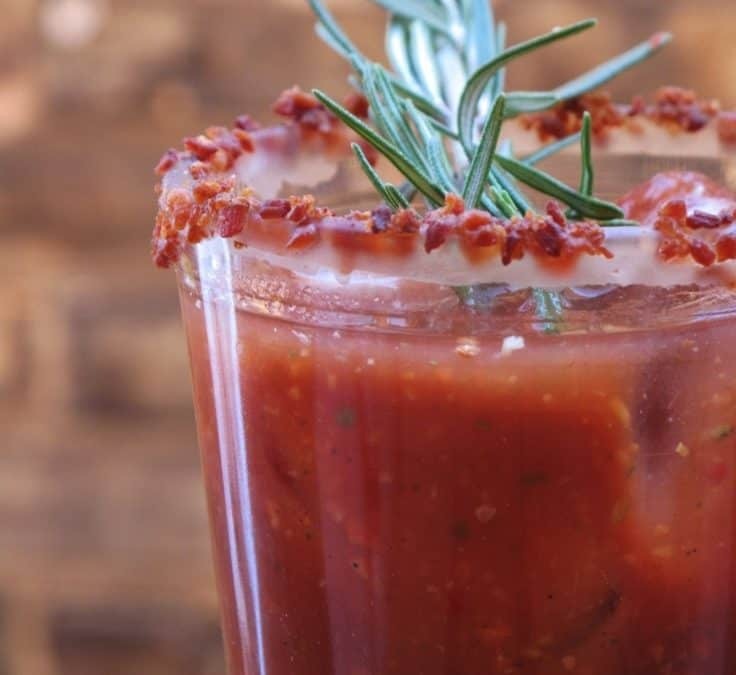 Let us know if you try this Keto Bloody Mary! Even though it a low carb bloody mary, it’s still very high on taste. Cheers!